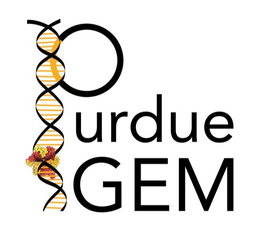 This year’s Purdue 2007 iGEM team will be presenting a project called “Bacteria Warfare” for this year’s competition hosted by MIT in November. The team is composed of a group of undergraduates from different majors including Biomedical Engineering, Agricultural and Biological Engineering, Biochemistry, and Chemistry. Escherichia coli (E. coli) is used to conduct the microbial warfare. The design is to use two different types of transformed E. coli. One type of E. coli produces protein that triggers the death gene of its opponent (but not for itself) which expresses the production of a protein toxin. One expresses green fluorescence protein and the other expresses red fluorescence protein so that the progression of the war between types can be easily viewed and monitored. The team decided the general topic of a bacteria warfare at the end of spring 07 and started design and construction of the warfare in summer 07.